Next to cockroaches and bed bugs, fleas are the most resilient and prolific of insects. Thriving in warm, humid conditions, fleas need one thing to survive–blood. Fleas also require victims with fairly dense body hair so they can cling to strands of hair, crawl down to skin surfaces and begin feeding. Fur also protects them from being easily scratched or bitten off the skin by dogs, cats, and other hairy mammals. Fleas are dark brown and have flat bodies that allow them to scramble quickly through a dog’s fur. Strong, grasping claws further enable them to hang on to hair strands. Although fleas do not have wings, their jumping abilities are astounding. With hinged hind legs perfectly designed for jumping, fleas can leap distances more than 40 times their tiny body length, which is why one dog with fleas can give another dog without fleas a flea infestation within minutes of contact with each other. Ensuring canines are flea-free is vital to their health and well-being. Fleas are known vectors of numerous bacterial and viral diseases. They also transmit tapeworms that attach themselves to a dog’s small intestine and feed off the nutrients passing through the intestine. Although canine tapeworms do not generally cause serious health problems, they will cause dogs to “scoot” their rumps across the floor to relieve irritation and itching. Alternately, puppies with tapeworms will suffer health issues such as anemia, reduced growth, and vomiting. Why Rid Your Home of Fleas with Natural Remedies? One word–chemicals! Many canines are allergic to flea repellents found in flea collars, flea shampoos, flea dips and flea medications that introduce substances in the dog’s bloodstream for killing fleas when they bite. One such flea-killing chemical is called imidacloprid, an active ingredient that may promote thyroid lesions, increase cholesterol and induce liver toxicity in dogs. Imidacloprid is a neurotoxin that works to kill fleas by paralyzing muscles involved in breathing. “Spot-on” flea preventatives contain pyrethroids or plant-based insecticides that may cause respiratory problems, blisters and body itching. Pyrethroids are also carcinogenic and have been shown to damage the thyroid gland and cause chromosomal abnormalities in mice. Instead of worrying about possible side effects of chemical-based flea preventatives for canines, play it safe and healthy with these effective and affordable home remedies for getting rid of fleas. To rid your home of fleas, fill a plate with water, add about two teaspoons of dish soap to the water and put a lit tea candle on the plate. Fleas, like most other insects, are attracted to illumination. The liquid soap will trap and suffocate fleas jumping onto the plate to get closer to the light. Place two or three plates in larger rooms, especially if they are carpeted. Rosemary is a versatile herb used for both medicinal and cooking purposes. To stop fleas from attacking your canine, place two or three drops of rosemary oil just above his collar. Make sure the oil reaches his skin by parting his fur if necessary. You can also make a rosemary flea dip by mixing equal parts of rosemary powder and water. Create rosemary flea powder for canines by combining rosemary powder with peppermint, wormwood, and fennel powder. To help rid your home of fleas, mix 1/2 gallon of water with one gallon of white vinegar, eight ounces of witch hazel and 16 ounces of lemon juice in a large spray bottle. Vacuum carpets before spraying to eliminate as many fleas possible. Vinegar flea spray can also be sprayed on furniture to kill fleas. This solution can be sprayed directly on canines. Mix one cup of apple cider vinegar, one ounce of Castile soap and one quart of warm water. Diluting apple cider vinegar removes the strong smell but does not reduce its effectiveness for killing fleas. You can add a few drops of cedar oil or lavender to make the smell more pleasant. If your canine has dry skin, add one ounce of aloe vera to the solution to help further repel fleas and keep his skin moisturized. Another natural flea repellent safe for use on canines is lemon flea spray. Just add six or seven lemon slices to a handful of chopped rosemary leaves. Boil four cups of water, pour the boiling water over the lemon slices and rosemary leaves. Next, add several drops of geranium oil and let the solution sit for eight hours. Strain the solution before pouring into a spray bottle. You can use this fragrant flea repellent on your carpets and furniture as well as your canine. Streaming grasses belonging to the Cymbopogon nardus family produces citronella oil, a natural insect repellent classified by the EPA as a non-toxic biopesticide. Found in many insect repelling lotions, candles and flea collars, citronella also has antifungal properties and helps heal mosquito, flea, ant and other insect bites. To make citronella flea spray, mix 15 drops of citronella oil, 10 drops lemongrass oil, 10 drops tea oil and five or six drops of geranium oil to a 1/2 gallon of warm water. Make sure to rub the spray into your dog’s fur so that the solution reaches his skin. Keep your dog flea-free by mixing three or four drops of cedar or lavender oil with two teaspoons of water and saturating your dog’s fabric collar with the solution. You can also place drops of diluted cedar or lavender oil on a bandanna and tie the bandanna around your dog’s neck. Essential oils like lavender and cedar are safe to use on puppies. Reapply the solution once every five days for effective flea control. Plant and cultivate pennyroyal herbs in gardens or flower beds to repel fleas. Place a drop or two of pennyroyal essential oil on your dog’s collar to stop fleas from infesting your dog. Dried pennyroyal flowers and leaves can be crushed, placed in a dry tea bag (remove tea first) and attached to your dog’s collar. Borate and Botanic dust are both effective and safe natural pesticides that can be used around pets and humans. In addition, borate dust (sodium borate) will continue killing fleas as long as it remains dry. Mix equal parts of borate dust and Botanic dust together and sprinkle over areas you know are flea infested to kill fleas and stop fleas from reproducing. Do not put borate or Botanic dust directly on pets. It could cause skin or respiratory irritation. Something in yeast paralyzes and kills fleas. Sprinkle yeast over your canine’s body and ruffle his fur to allow yeast to reach the skin. You can also make a flea spray using yeast. Extract juice from a fresh lemon, add two tablespoons of water, one tablespoon of yeast and boil. After the mixture cools, just pour it in a spray bottle and spray your canine. Essential oil made from the fleabane plant is called Erigeron oil. Containing l-limonene, a chemical found in citrus fruit peels and a variety of other plants, Erigeron oil not only repels fleas and gnats but also blends well with citrus oils and peppermint, another herb known to help get rid of fleas. Clove oil is another essential oil that offers effective insecticide properties. Just place a couple drops of clove oil on your dog’s collar or bandanna to keep fleas from bothering him. 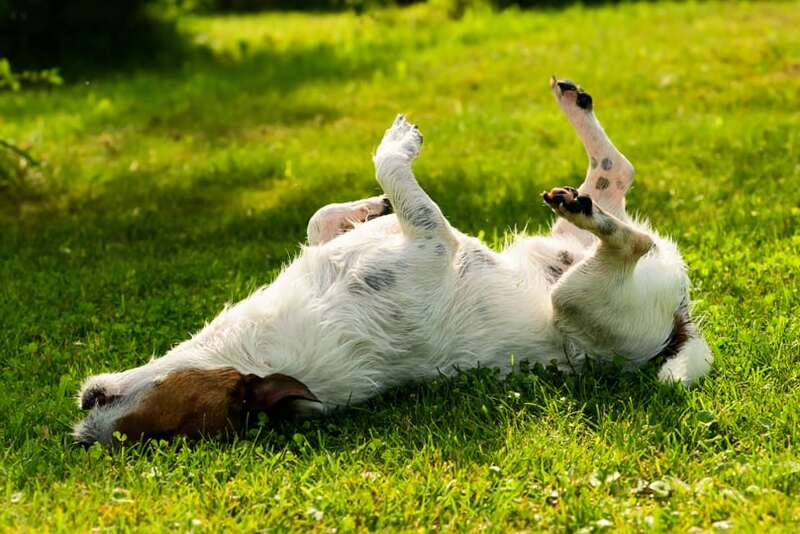 Fleas cannot tolerate most aromatic oils and will jump off as soon as they detect the smell. Diatomaceous Earth is a non-toxic powder comprised of fossilized diatoms that dissolve and dry out flea eggs before they can develop into adult fleas. Available at garden centers and health stores, diatomaceous earth comes in two types–food grade and industrial grade. Make sure you purchase the food grade kind of DE that is safe to spread in your yard and where your dog tends to spend most of his time. Be aware that DE may cause minor lung irritation until its “dustiness” has settled. Wear a paper mask and don’t let your dog near the DE for about an hour after spreading the dust. In addition to being a natural flea repellent, coconut oil is also a great moisturizer and curative for skin irritations. Just rub unrefined, virgin coconut oil on your dog’s skin and fleas will jump off immediately and die. Put your dog in your bathtub when you use coconut oil for fleas so you can quickly rinse fleas down the drain. You can also mix water and coconut oil in a spray bottle. Spraying your canine daily is a safe, highly effective method of natural flea control that also makes him smell pleasant. If your dog eagerly licks coconut oil, don’t worry. With its antioxidant, anti-inflammatory qualities, coconut oil is actually beneficial to your dog’s health. However, you might want to put an old t-shirt on your canine to prevent him from licking off coconut oil before it has a chance to saturate his skin and kill fleas. Although most of us love the smell of essential oils, remember that your canine’s sense of smell is 20 times as sensitive as the human sense of smell. A few drops of the more aromatic essential oils is all you need to stop fleas in mid-jump so don’t go overboard when using essential oils to get rid of fleas. Other types of essential oils you can use as flea preventatives include sage, sweet orange, and bergamot. Herbs such as peppermint, sage, lemongrass, neem leaf and cloves can all be made into sprays or dips by boiling them in water and steeping herbs until the solution has cooled. If your canine seems irritated by an herbal dip or spray, you may have made the solution too strong and need to dilute it more with water. Castile soap is effective for getting rid of fleas. Made with natural fats and oils, Castile soap actually disrupts cell membranes in fleas and other insects, causing insects to rapidly dehydrate and die. The ingredients in synthetic soap only slow down a flea’s cellular activity. If you bathe your dog in people shampoo, fleas will hang on to the his hair follicles (near the skin’s surface), wait until you rinse your dog and spring back into action again after drying off. 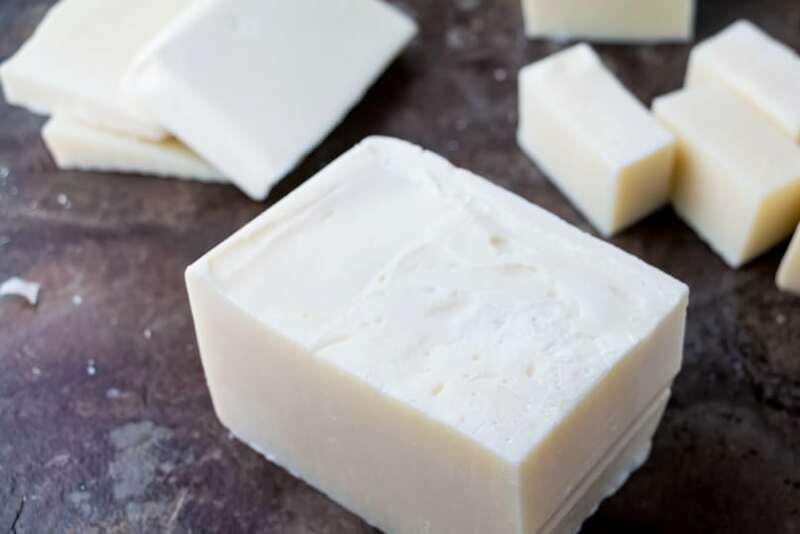 Instructions for making Castile soap using the cold process method can be found here. Natural bug repellents can be used to stop pesky insects from pestering and biting your canine. There are many non-toxic household items which can be used to keep the bugs away, most of which you might already have in your home. If your canine loves nothing more than to lay on your back porch, under a specific tree or in a certain area of the yard but is constantly bothered by ants. this may help stop those ants from crawling over him. First, find where the ants are originating from (sand hills with entrances leading below the ground, for example), put mint tea bags or some crushed cloves near the sand hill and spray the ants with soapy water. Also, if you draw a line with chalk where the ants enter their nest, they will be unable to cross over that line. For trees being attacked by ants, wrap your tree in a newspaper, then put sticky goo, which can be bought at a hardware store, all over the paper. Ants will stick to the paper and won’t bother your canine. Keep mosquitoes at bay outside your home by planting marigolds around your patio or back porch. Clove oil is also an effective mosquito repellent but be careful as it might irritate canines with sensitive skin. Other mosquito repellents include lavender, eucalyptus, rose geranium and peppermint. Flying insects such as flies and mosquitoes can be repelled by placing drops of diluted almond oil or citronella on your canine. Basil, pennyroyal oil and tansy are also good natural fly repellents. You can also mix white wine vinegar, water, neem leaf oil and mild dishwashing liquid as a bug repellent. Just combine all ingredients in a spray bottle and shake before using. Always empty your vacuum cleaner as soon as you are done vacuuming. Sprinkle borax in the bag before throwing the bag away outside in your trash can. Before vacuuming, add several drops of a flea-repelling essential oil to two cups of baking soda and sprinkle over your carpet. Let the powder sit for about 45 minutes before vacuuming. In addition to vacuuming frequently, wash your dog’s blankets, beds and toys every week in your washing machine. You can sprinkle the baking soda/essential oil flea repellent on bedding and vacuum but washing bedding in hot water using Castile soap guarantees fleas are killed. Allowing high humidity levels to exist in your home invites unchecked growth of mildew, mold, and bacteria that thrive on warmth and moisture. Insects such as cockroaches, termites, fleas, dust mites and moths also flourish in these conditions, contributing to health problems, home damage and a tenacious infestation potentially requiring the services of a pest control company. Stop fleas from infesting your home and your canine by using a refrigerative/mechanical dehumidifier to reduce humidity levels in your home. These dehumidifiers work to eliminate excess moisture from the atmosphere by pulling humid air over cooling coils supported by fans that blow drier air into the home. When air temperature decreases, the ability for the air to hold moisture also decreases. Condensation created by this cooling effect drips into a special pan that does not interfere with the dehumidifying process. A lot of care can go into using natural home remedies to keep your dog and home free from fleas. But the effort to avoid the toxic chemicals is entirely worth it.